Can a girl ever have too many handbags, tots, or wallets? You do need purses that go with the change of season, ones that go with certain outfits, and ones that fit the occasion. Of course, you will also need ones that are sized properly depending on where you are going. If you have younger children, you may need a larger bag if you are going to a place like the zoo. However, if you are just running out the store you could probably get away with a wristlet or a smaller handbag. The choices are just endless. Of course, you also need a bag to house all your electronics. It is a good thing BagInspiration has something to fit everyone’s needs. BagInspiration is a green company that affords you the opportunity to get a great looking, stylish bag that makes you feel good. The creators of BagInspiration are Michelle and Stefanie who met in 2000 while their children were in a playgroup together. Inspired after seeing Mexican candy wrapper bags in Mexico, they went on to pursue their own dream of creating amazing bags made of recycled materials. Their bags are made out of materials, such as Mexican candy wrappers, juice pouches, seat belts, and used tires. They are also certified as fair trade products. The Urban Junket Robin Laptop Bag is beautifully made out of 41 recycled bottles. It has a plethora of pockets to put all of your gadgets as well as nice thick padding on the inside. It also has a convenient pocket on the backside of it that can be used as a place to store your luggage handles. You will enjoy knowing the canvas is coated with eco-friendly non-toxic dyes, and the lining is made of RPET, which is fabricated recycled plastic bottles. This is the best bag I have ever owned. Seriously, I take it with me on every outing. I can store my laptop, iPad, dSLR camera and all the normal stuff a purse would carry. It has a handy dandy opening on the back which will slide right over your luggage. This feature makes me the envy of my husband who it still toting and old fashion duffle bag. There you will also find more information on the company and a look at the other eco friendly bags they have to offer. Tell me what bag you like best that BagInspiration has for a chance to win a $25 GC. I really like the Handmade Bag | Baabaazuzu Hobo Bag, it’s a really nice bag. thank you for this chance. 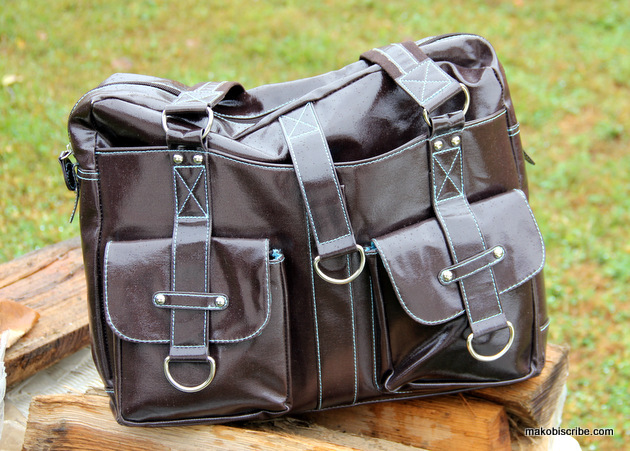 I like the Chico Messenger 10 bag in Onyx. Need this for a carry on bag. looks comfortable to carry too. I like the hipster bag in purple. I love the Maggie Bags Seat Belt Bags – Cicily Bag. I like the Urban Junket Robin Laptop Bag best. When I travel, it would be the only bag I would need to take to hold all the extras I bring. love a good messenger bag! Urban Junket Robin Laptop Bag is the one I liked the best. I like the Flip and Tumble shopping bag. I like the Lacy Jute Purse. The seatbelt bag is awesome. M and M Purse | Ecoist M&M Red Every/Any Bag This bag is cool!